Is green militarisation a right response to curb poaching? While the Duke and Duchess of Cambridge were enjoying their tour in Assam’s Kaziranga National Park a week ago, a rhino was killed barely 20 km away from the lodge they were staying in. 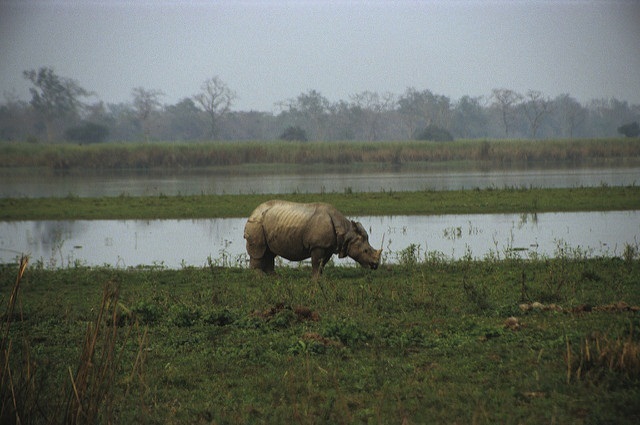 Kaziranga has often been described by conservationists as a model for protection of endangered wildlife in India for having adopted the militarised form of conservation with its controversial “shoot-at-sight” policy. This policy is similar to the militarisation of the conservation movement in Africa, also known as “green militarisation” or “green militarism” where army personnel and veterans provide training in arms and ammunition to local people to combat poaching. While many conservationists across the world hold a positive view of military intervention for wildlife conservation, others, along with human rights groups and social scientists, criticise such a step. They take this to be an extension of the “fortress conservation” approach which has largely alienated local communities from their traditional forest rights. Stephen Corry, the director of Survival International, a non-profit, believes that green militarism has converted some wildlife reserves in India into “war zones” and local communities and tribals are often caught in the crossfire between wildlife managers and poachers. “These communities have largely been made to pay the price for conservation in India since they were displaced from the forests they once used to occupy to make room for animals and large-scale tourism,” Corry said. According to Trishant Simlai, a conservation scientist by training, there is a growing concern that wildlife conservation is increasingly being portrayed and perceived as a “war” in which conservationists are taking a moral stand against poaching with a simplistic view of a very complex problem. Simlai writes in one of his articles that “the overwhelming moral urgency which conservationists and NGOs are placing on the protection of certain selected species and presenting graphic images to the outside world are not being completely forthright and are deceiving the general audience by not adequately addressing the complex social, economic and political processes that drive these conservation issues”. However, Simlai’s observations are largely confined to the developments in militarised conservation in certain parks and countries in Africa and he warns against making equivalent inferences for the national parks and wildlife sanctuaries in India. Contrary to Corry’s viewpoint, Simlai feels that there is still much to be known about the militarised form of conservation in India, as it is a growing trend observed only in a few parks and sanctuaries in north-east India such as Kaziranga and the Manas Tiger Reserve in Assam and the Pakke Tiger Reserve in Arunachal Pradesh. This trend may not be as severe as it is in Africa, but can grow if not checked. The controversial “shoot-at-sight” policy has helped in slowing down the rate of poaching, but definitely not stopped it. The problem lies in the way how poaching and poachers are being perceived in India by many conservationists and the forest department officials, Simlai added. A study by Adrian A Lopes, assistant professor of economics, American University of Sharjah, in 2014 concluded that the political instability and insurgency in Assam were “significantly and positively related” to the rise in rhino poaching in Kaziranga. There are reports that the United Liberation Front of Asom separatists have carried out rhino poaching and funded their armed struggle through rhino horn sales during the civil unrest in the state. There are also reports that rebel groups in Assam have been approached by the China-based Longhui pharmaceutical company, a subsidiary of arms manufacturer Hawk Group, for supplies of rhino horns in exchange of advanced weapons. Conservationists must include these underlying complex factors with an approach towards obtaining a holistic and broader perspective while researching about poaching and relevant conservation actions, Simlai said. Many conservationists share a viewpoint that subsistence hunting should not be termed as poaching, especially when it is carried out by poor indigenous communities who kill animals only for a living. Duffy suggests that in the past few years, "the framing of discussions about poachers have been so violent and militarised that it has promoted the definition of poachers as equivalent to terrorists". Such a perception about poachers is dangerous as it has been instrumental in shaping up the idea of modern day conservation as “the war”. Niki Rust, conservation biologist and specialist in carnivore conservation and man-wildlife conflict describes in her paper various macro and micro socio-economic factors such as disparity in resources (education, wages, land ownership and job opportunities) and the practice of apartheid which have fuelled poaching in Namibia. Rust describes in her research that farm workers in Namibia, who belong to indigenous communities, have resorted to theft of livestock and poaching of wild animals as a response to the racist and unfair treatment by farmers, who are usually their employers. It will not be a surprise if similar results are found in India if observations are made to understand why poaching thrives despite the presence of stringent laws for wildlife conservation. There is a long history on how poor, indigenous communities of India have been treated for hundreds of years by all sorts of rulers, including successive governments in post-Independence India. Simlai told Down To Earth how tribal communities are exploited by the forest department under the pretext of fighting poaching. There are also reports of blackmailing local community members for such favours. Many incidents have been reported where the forest department officials have threatened them with poaching charges for merely being present in the forest, Simlai said. Organised poaching which is carried out by technologically-advanced organised gangs having good networks, sophisticated arms, Global Positioning System (GPS) and mobile phones, are being fought by wildlife managers with unmanned aerial vehicles or “conservation” drones, camera traps, GPS and arms. But demarcations are yet to be made between subsistence hunting and organised poaching and many grey areas in between the two. In the absence of such demarcations, the so-called war consumes all, even the precious knowledge of the local subsistence hunters which can be used as a tool to fight illegal wildlife trade. “As far as the use of modern warfare for conservation is concerned, without addressing the fundamental ground level necessities such as well-trained and well-equipped staff and the faith in military technologies, there is no logic for using these against unarmed local subsistence hunters who are not enemies,” Simlai added. As described by Corry, tribal or indigenous people are “eyes and ears” of the forest and are best placed to prevent, catch or report poachers. The funders, who are often individual donors, should be careful about financially supporting armed resistance against poaching. When the success of conservation efforts are being measured in terms of how well we are trying to protect certain animals, all interventions, even the militarised ones, are being justified by conservation groups, with little consideration about the implication. It requires a good deal of focused research on what drives a person to become a poacher. There are several socio-economic and political factors involved which should be understood and acknowledged before forming a knee-jerk response about poaching. According to Simlai, not resolving the underlying cause of what drives people to poach is the main reason why military solutions for conservation fail. Fortunately, militarisation of conservation in India has not remotely reached the form in which it exists in some countries and parks in Africa, but there is danger that it may follow suit in our country too. It is high time we review our approach to combat poaching and introduce people-centric methods of conservation before it becomes a full-blown war in the name of conservation. If that happens, indigenous communities, forest department personnel and wild animals will be badly affected. The so called ‘Green Militarisation’ is likely to spread to more Protected Areas where some of the poorest people in the world live, as well as several species of wildlife on the verge of extinction. The unfolding of this trend (whether or not it will work in the long run) is because of many reasons and we know it’s all quite complicated; the poverty, the politics, the poorly trained and equipped and lowly paid forest guards and those above them, the organized poaching mafias and so forth. In the larger global interest (we are all stakeholders), the threat of extinction to a species (say the Indian Rhino) becomes an over-riding priority for conservation. This is also a situation where several actions have to be taken, many simultaneously, and for ‘pretty’ long (Project Tiger started in 1973 and we’re still at it and the Tiger remains critically endangered, thanks mainly to poaching, but has been saved from extinction). The issues around poverty are usually historical and linked to several ‘causes’ including inequality and injustice, the Market and politics, separately and together, and cannot be addressed under a conservation strategy alone. 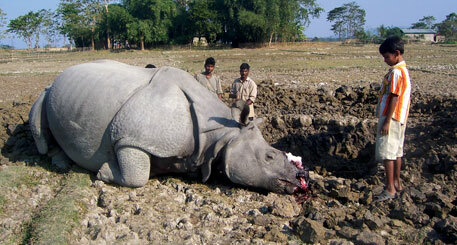 Most people around Kaziranga were as poor if not more before the national park was set up. The question of the Rhino getting closer to extinction (for which the park was set up) takes precedence. While poverty in and around our best forests (mostly national parks and sanctuaries) will take a long time to go away, the Rhino and other species on the ‘death row’ have no time left. In the absence (or failure) to put together a more credible and effective strategy to save these species, Green Militarisation looks like the only quick ‘working’ solution feasible. In much of the Protected Area Network of India, where physical protection is weak, there are hardly any viable populations of threatened wildlife remaining.